The Victorian Era (1837-1901) witnessed significant change the design of fire surrounds. Just as the Regency fire surrounds had become simpler in structure and less elaborate in design than their Georgian predecessors so the process continued after Victoria came to the throne. 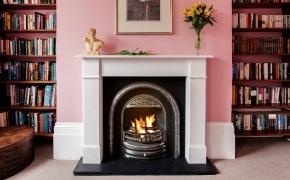 Victorian fireplaces and fire surrounds are typically very functional in design – built around very simple architectural shapes such as a rectangle or an arch. There is no hint of the Palladian echoes of Greek or Roman influence. In most cases decoration is limited to a carved corbel (a French influence) and/or inlaid panels. There were departures from this norm with more elaborate designs often referred to as “Gothic” in influence. These tended to be found in large formal buildings or the homes of the recently wealthy. The more simple form of most fire surrounds in the Victorian era was driven by the vast increase in houses built to accommodate the rise in population and the mood of virtuous functionality. 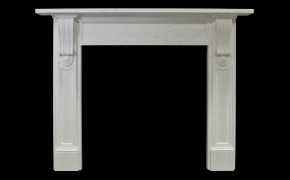 Victorian fireplaces were made from marble stone or timber and very often combined with an arched insert. The arched insert itself reflecting advances in design that allowed more heat to be generated from a smaller fire and a more efficient means of evacuating smoke from the room. Many of the vast number of Victorian houses that are still in use today maintain the look of a Victorian fire surround because it suits the proportions of the rooms and seems not to clash with modern décor. Here at English Fireplaces we offer a collection of hand carved reproduction Victorian fire surrounds including all the main styles: the Classic Victorian, the Victorian Corbel, the William IV and the Victorian Arch. We often accept commissions to reproduce the more elaborate Gothic surrounds from images supplied by clients.